Modern Winters pale into comparison with the real "big freezes" of 1916-17, 1946-47 and 1962-63. These were however, general exceptions to the rule, but even Winters termed "normal" would still produce snow and occasional periods of cold for some length of time. 1981-82, 1984-85 and 1985-86 were Winters which also produced periods of very cold weather. Cold weather movements are a rare event in modern Winters. Today's much milder conditions rarely contain a period of weather substantially cold enough to initiate movements by birds in search of milder conditions. Several very cold days are usually needed - preferably coupled with snow in the north/north-east of the country. This will often trigger birds to move as the ground freezes. Typical species most commonly associated with such movements are Skylark, Lapwing and Golden Plover. Other passerines (especially ground-feeders) are also susceptible to such movements, as are gulls. It's most often Lapwing which are the first indicators of the effects of sub-zero temperatures in other parts of the country or even on the Continent. High-flying groups heading west or south-west, the thing I look for. Unlike days during the Spring and Autumn migration periods, when birds are often recorded from at (or just after) first light onwards, most cold weather movements can be slow in starting. I record most movement from mid-morning onwards until early afternoon. As a visible migration enthusiast, the second day of any cold spell seems to produce the highest movements and hard weather movements help to alleviate the wait between traditional Autumn and Spring migration periods. On December 31st 1996, observations from my former patch at King's Mill Reservoir commenced as usual from first light (8:00am). The first two hours were very quiet and nothing was noted despite high expectations. However, at 10:00am around 50 Sky Lark flew through. Conditions at the time were clear blue skies, but shortly afterwards, cloud rolled in and heavy snow ensued. So also did a remarkable Sky Lark passage. Over the next three hours, some 2 245 Sky Lark moved south-west. All of the flocks were low due to very bad seeing (low cloud-base and heavy snow) so many must have been missed. 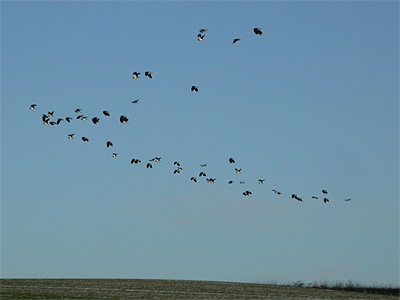 A short cold spell in early December 1998 saw movement on only one day, when 115 Lapwing flew south-west on December 6th. The area also held higher than normal numbers of Golden Plover. 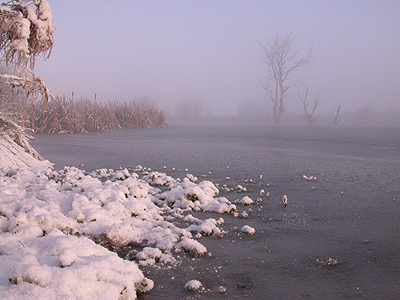 Small amounts of snow in the Eakring and Kersall area on December 28th 2000, was bettered by much heavier snowfalls (coupled with sub-zero temperatures) in the north-east of the country. This meant a departure by some species away from such conditions and dominant species involved in these movements were Sky Lark and Lapwing. Movements took place over a four day period, with only Lapwing (1 290 south-west) being recorded moving on all four days. The cold weather also brought with it several area rarities, including a Short-eared Owl in the Red Hill/Eakring Flash area on the 27th, a Stonechat at Eakring Meadows (30th) an adult Iceland Gull (recorded again on January 1st 2001) and a Woodcock at the Sewage Works on the 31st. There was only limited movements during December 2002, occurring during a short period of frosty conditions. The only recorded movements between December 5-11th involved small numbers of both Lapwing and Golden Plover. South-westerly moving Lapwing flocks were also only noted on three of the seven days, with Golden Plover appearing on just one date. An odd record clearly associated with the conditions, was that of a Redshank moving south-west on December 11th. There was some snow in northern parts of the UK during the first days of January 2003, followed by a period of very frosty conditions, with some snow in eastern counties. Opening days of the cold spell were surprisingly quiet and there was little bird movements away from the sub-zero conditions. A Dunlin was at Eakring Meadows on January 5th. This was the first ever record outside of the traditional Spring and Autumn passage periods and a very unusual record. Dunlin also turned up at several other Nottinghamshire sites the same day. Not until the third day (Jan 6th) did the only movement occur when 208 Lapwing went west. Earlier the same day provided a short-lived movement of 68 Herring Gulls. Some of the Eakring area's most recent examples of cold weather movement, were in December 2009, when snow and freezing conditions saw totals of 298 Black-headed Gull west, 29 Common Gull west, seven Snipe and 37 Lapwing west (December 19th) 80 Black-headed Gull west, six Meadow Pipit west, 68 Sky Lark south-west and south, seven Redwing south, 269 Golden Plover south-west, 656 Lapwing west and 17 Snipe west on December 20th. This was the first time that I had noted an obvious movement of any gulls in cold weather and this movement of smaller gulls was indeed very obvious. December 20th also saw very good counts of both Herring (106) and Great Black-backed Gulls (99) south-west, but it was more difficult to tell if these were genuine cold weather movements. Further, slight movement was detectable on December 26th, with counts of 27 Sky Lark south-west and south-east, five Meadow Pipit west, 41 Redwing south and west, 12 Fieldfare south, small numbers of both Yellowhammer and Lesser Redpoll and 105 Black-headed Gull. 105 Great Black-backed Gull also went south and south-west with 80 Herring Gull and nine Common Gull went south-west. Early January produced some movement on 3rd, with 72 Golden Plover south-west and 71 Sky Lark east and south-west. Almost certainly as a direct result of the very cold and icy conditions was a record movement of 395 Herring Gull high south and south-west and 84 Great Black-backed Gull. Following heavy snow and continuing extremely cold weather throughout the UK on January 5th, more movement was inevitable. Unfortunately, this occurred during the week, but there was still some limited movement on January 7th. Birds and totals involved included 77 Lapwing (19 low south-west and 58 high south) 11 Sky Lark south-west, 38 Lesser Redpoll east and south-east, 16 Linnet south-east and south-west and eight Fieldfare south. Some cold weather movement of Sky Larks through the area on February 5th, following overnight snow across much of the UK. An early morning visit was not thought worthwhile, and it was not until two groups of Sky Lark were noted moving south over Market Warsop, that a visit to Eakring was made. Very misty conditions with only limited visibility for much of the watch probably led to much reduced counts, but it is likely that movement was almost over by late morning. Several groups of Sky Lark totalled 225 south, with other counts including 17 Lapwing south and south-west and eight Pink-footed Geese east.